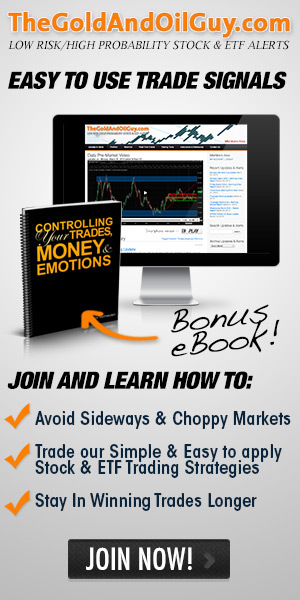 This Wednesday turned out to be an exciting session with all 5 of my trade ideas moving in our favour right on queue. The most common trade is the oil one with most traders adding more to Tuesday when the price reached its key resistance level on the chart. Also many traders took partial profits Wednesday locking in 3% or more in two days using the SCO ETF. 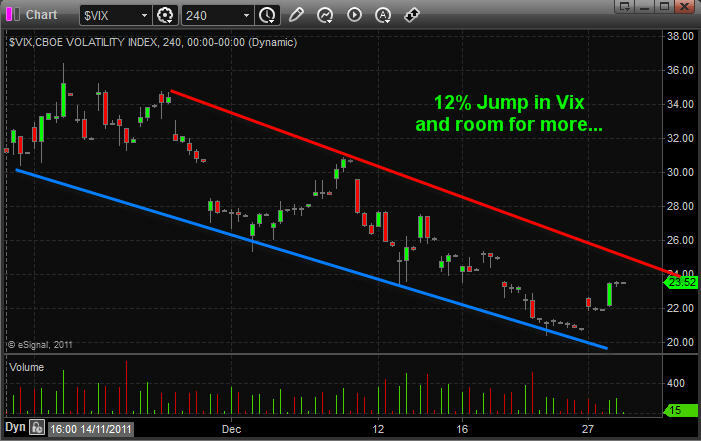 It’s amazing how many people like to trade the vix using ETFs. The best trade from followers thus far was an 8% gain in TVIX which was bought 4 days ago anticipating the pop in volatility which I had been talking about last week. Keep in mind ETFs for trading the vix are not very good in general. I stay away from them, but TVIX is the best I found so far. Currently stocks are oversold falling sharply from the pre-market highs. Meaning stocks have fallen too far too fast and a bounce is likely to take place Thursday. Also we saw some panic selling hit the market today with 14 sellers to 1 buyer. That level tells me that the market needs some time to recover and build up strength for another selloff later this week or next. 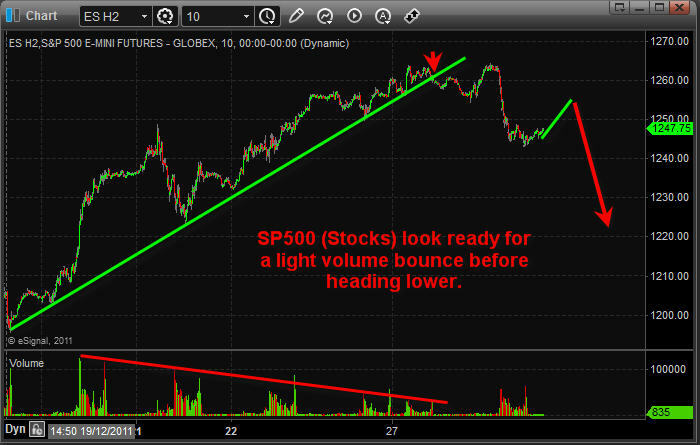 We will see this pause unfold when the SP500 drifts higher for a session or two with light buying volume. This will confirm sellers are in control and give us another short setup. 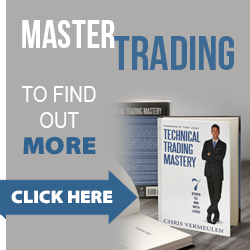 I hope this helps you understand things more… Over time you will pickup on a lot of new trading tips, tools and techniques with this free newsletter so just give it time and keep trades small until you are comfortable with my analysis. ONE TIME OFFER for 2012! Just because a commodity is not under the direct spot light does not mean you can’t trade it or make money from it. 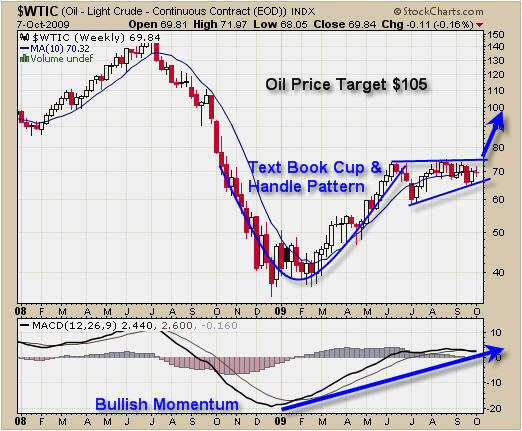 With that said here is my analysis on how to trade oil if $100 per barrel is reached in the coming trading days. Here you can see how oil is trading round the $100 level. 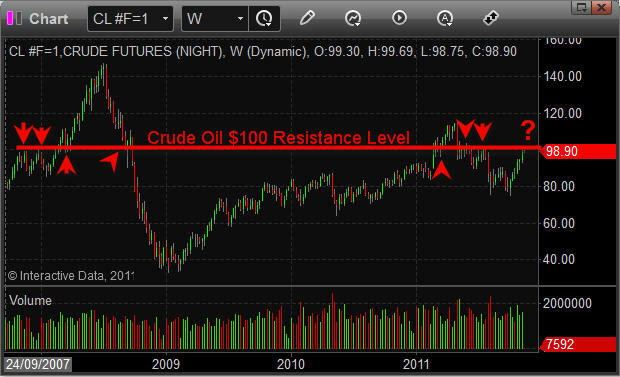 When the price is trading below it then $100 will act as resistance and when oil is above then it becomes support. 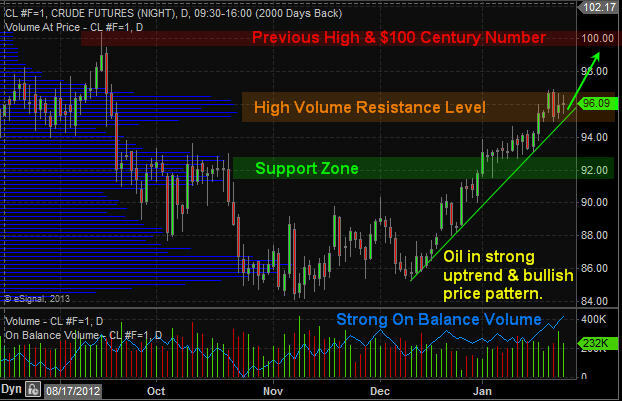 This is more of a close up look at oil and the $100 price point. Notice how oil has moved higher for an entire month without any real pullbacks and that it has a clean support trend line underneath. If oil sees some big sellers step in here at the $100 – $104 level then I expect the green support trend line to be broken. 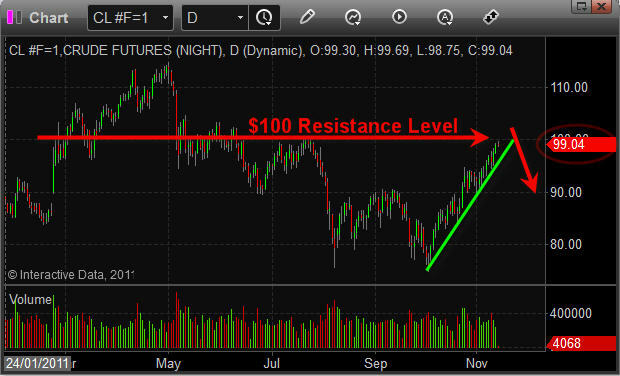 If that takes place oil could quickly and easily drop back down to the $90-$92 area. This chart shows a long (bullish) oil ETF along with its price by volume levels. I like to review the price by volume analysis from time to time when nearing a major support or resistance level on a chart. For those who have difficulty finding support and resistance levels then this indicator/volume analysis tool will take most of your guess work out of the equation. To make a long story short, the longer the volume bars on the left side of the chart are then the more people either bought or sold crude oil at that price. Keep in mind that it does not matter if they bought or sold here… the key to remember is that there are a lot of new positions here and that is where people exit their positions at breakeven because they held such a large draw down over the past few months and just want their money back. Most traders and investors who trade off pure emotions (fear/greed) would have held a losing position through the August – October selloff and are now going to be more than happy to exit the trade at breakeven and move on to the next emotional roller coaster. 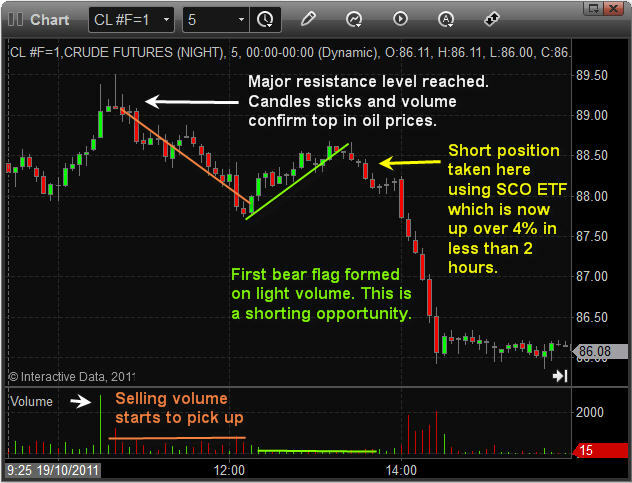 It’s this type of trading which allows the non-emotional traders who thrive off of price action and mass psychology to catch price swings in the oil market. 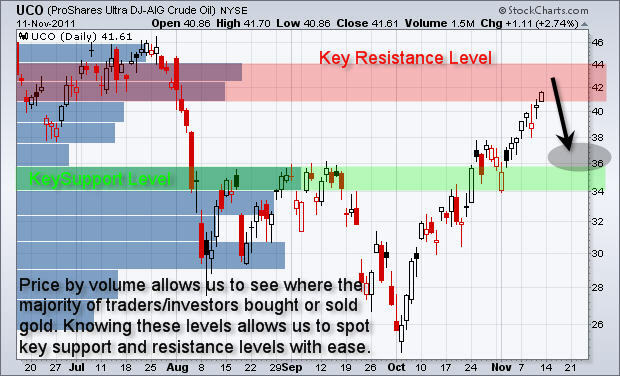 The chart below clearly shows that oil is entering into resistance level and a pullback is becoming more likely each day. 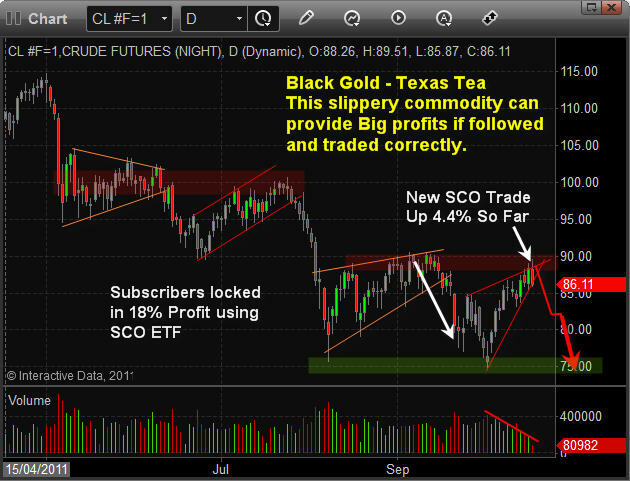 Those looking for an etf how to trade oil should look at buying SCO ETF. This oil ETF goes up in value when oil loses value. In short, oil is becoming overbought meaning it has moved up to far too fast and should have some profit taking shortly. The fact the oil is reaching a century number ($100) I feel there will be a couple days of selling starting soon. Traders looking to play this support trendline breakdown should look at trading SCO oil etf. 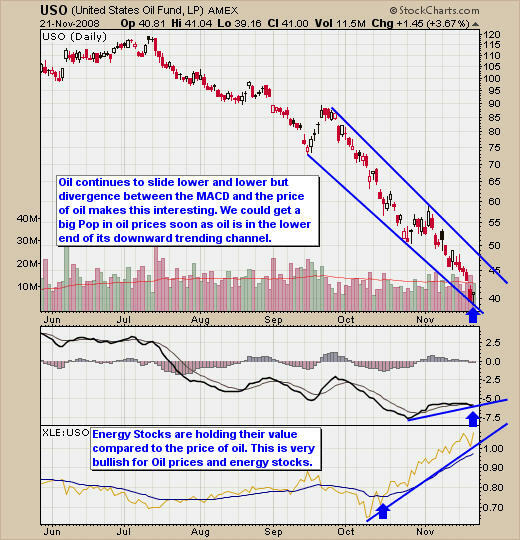 How To Trade Gold & Oil – The past couple weeks have been tough for most investors. The recent light volume rallies which have taken place in gold, oil and stocks has been generating mixed signals for technical analysts like myself. In order avoid a large draw down on your trading capital you must focus on the long term intraday charts. What is a long term intraday chart you ask? It is simply a 4 or 8 hour candlestick or bar chart. For example the charts below in this report are 4 hour charts. So each candlestick represents 4 hours. If you used a daily chart then this information would be condensed showing you the daily high, low, open and closing prices. While the 4 hour futures chart shows you large multi intraday chart patterns that most traders would never see… Patterns not seen by the average investor have a higher probability of working in your favour. Also these patterns are much larger than just normal intraday patterns which you see on the 5, 10, or 60 minute charts. Remember the larger the pattern the more potential profit there will be. These longer time frames allow us to follow gold, silver, oil and stock indexes around the clock 24/7 using futures contracts. Think about it… regular trading hours from 9:30am – 4pm ET only allows you to see 1/3rd of the price action each day. That means you are only seeing parts of larger patterns while the 24/7 contracts show you ALL Price Action. 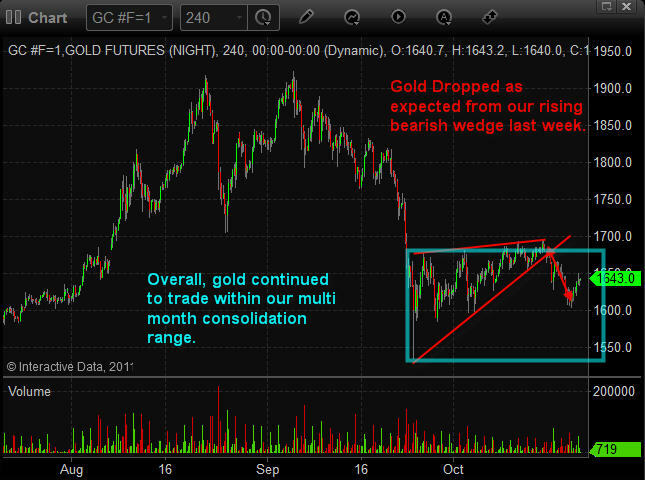 Gold finally broke down from the bearish rising wedge which it had been forming through late September until mid October. 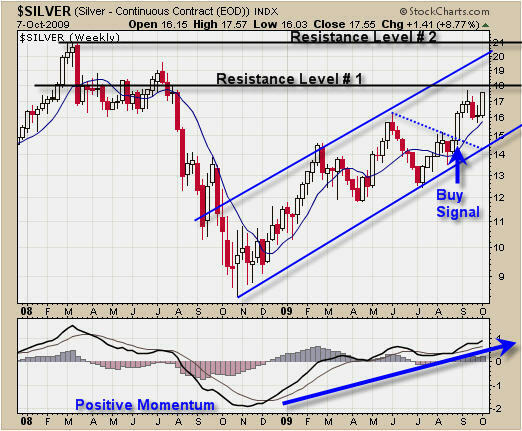 I know the majority of traders, investors, and financial newsletters have already positioned themselves either long or short the metal as they anticipate the next major move. I will agree that a large move either up or down is just around the corner but what sets me apart from others is the fact that I don’t bet my hard earned money when the odds are 50/50. I don’t pick tops or bottoms; rather I wait for a clean break out or low risk entry point. Only then will I take action. Until the blue box on the chart has been broken with some type of retest I will continue to observe and analyze the chart of gold. 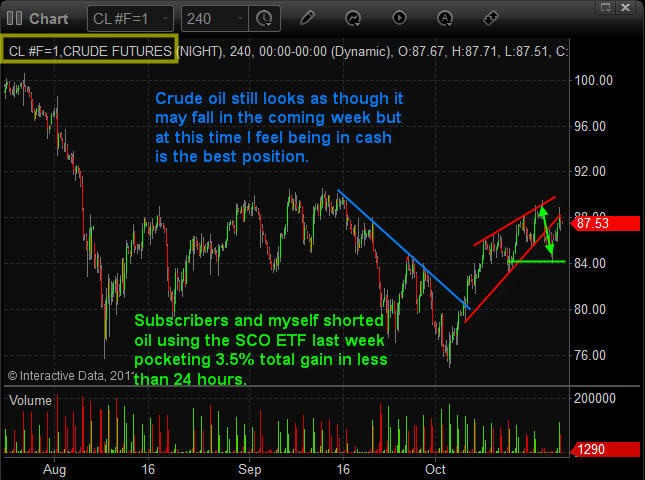 The past month crude oil trading has been very profitable for subscribers and me. We shorted crude oil using an inverse etf in September which moved over 20% in our favour within a few trading sessions. And just last week we shorted it again for a 7.5% move in less than 24 hours. Overall I am still bearish on oil but have moved to cash until I see another high probability setup unfolding. 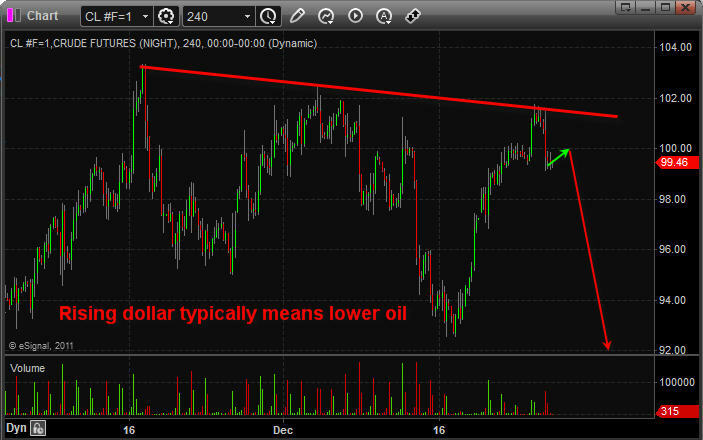 The recent price action in crude oil makes the odds about a 50/50 bet as to which way it will break next. This is why I have moved back to cash and pocketed the quick gain. More times than not it is seen as a bearish pattern and price generally falls afterwards. But in rare situations which I think we could be experiencing now this broadening price action can be very bullish, meaning much higher prices ahead. So I continue to observe and prepare for a possible trade setup. The best position right now is in cash and if something unfolds this week to our favour, then we will get involved but I am not going to take a 50/50 guess on what the next move is until the odds are in favour to one side or the other. August until now (October 24) the SP500 is down -3.7% and Gold is up 1.1%, Silver is down 20% and oil is down -7.2. Subscribers of my newsletter have pocketed over 38.5% in total gains using my simple low risk ETF trading alerts. If you have a website and would like these reports and videos displayed instantly on your financial website use my Best Free Financial RSS Feeds. Risk Management is what is needed if we want to stay in the game over the long term. Follow strict risk/reward rules is a must so that we don’t not get caught chasing stocks and funds only to have them turn around on us a few days later. Focusing on keeping risk low for potential trades is crucial for turning a profit over the long run. In short I look for a basket of indicators including candle patterns and volume to be in favor when buying or selling a stock or fund. When a fund generates a buy signal I wait for a low risk entry point near my support or resistance level depending if I am looking to go long or short. I need to see a perfect setup so that the odds are favoring my side. Only then will I take a stab at the market. The biggest issue with this is that I do miss a lot of good trades, but the key here is that most of my trades are profitable and that is what makes it so powerful. I would rather make 20 trades a year, than 150 trades and make the same profits. 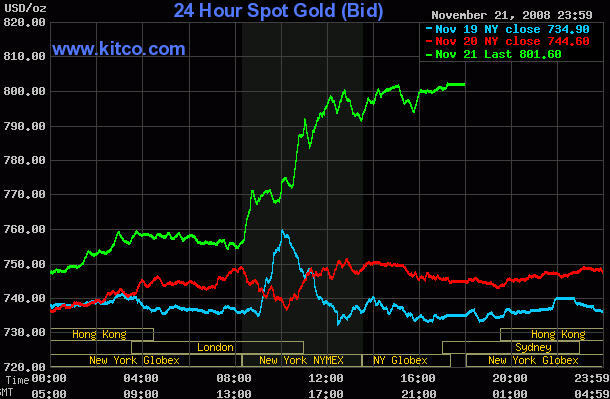 Gold continued its push higher last week getting a lot of investors and traders all excited. 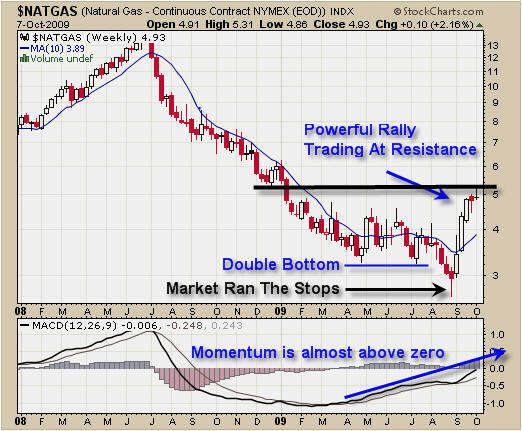 The daily chart does look strong and it is currently on a buy signal. But buying at this level is much too high of a risk. The price of gold is trading at the top of its 4 month trading range which previously led to a 20% selloff in bullion. 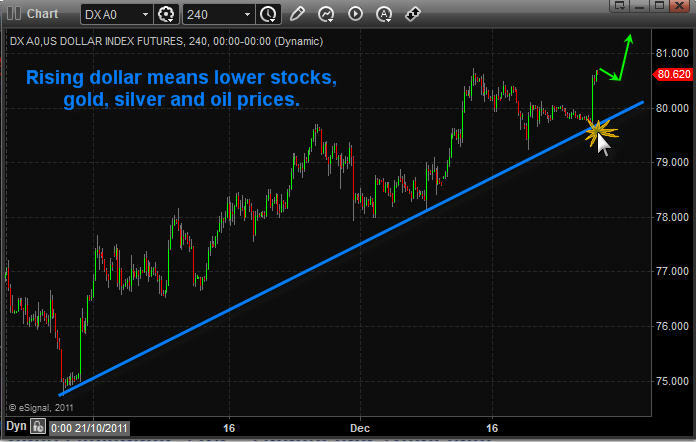 Our support trend line is 10% away from the price of gold making it out of reach still. I trade reversals when risk is only 3% from my stop/support price. Gold stocks have been struggling to move higher and last Friday gold made a nice move higher while gold stocks sold down. My last article talked about how trading gold (GLD) may be a better investment then gold stocks right now simply because of the bearish broad market. The broad market looks like it’s about to make another leg lower and when the broad market sells off, it pulls all stocks with it. 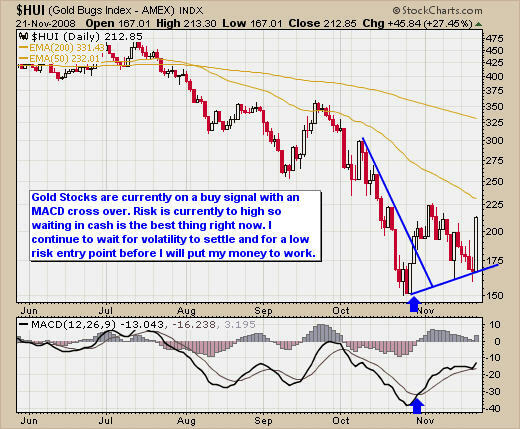 The daily chart of the HUI Gold Bugs Index shows precious metal stocks moving sideways while gold pushed higher. When gold stocks start to underperform the price of gold I tighten my stops and mentally prepare myself for gold to pull back. The smart money always seems to move in and out of stocks faster than the commodity which is a topic I mentioned in a previous report as well. Crude Oil has been under continuous selling pressure for the past 7 months and this is the first buy signal I have had for it since it topped back in July 2008. The weekly chart is very close to a buy signal. If you look at the weekly chart of USO crude oil fund you will see that volume has shot through the roof which generally indicates a turning point. Also the MACD indicator is about to cross which will put this fund on a buy signal if things go well all of next week. The support trend line is trending up slightly and the down trend line is holding the price inside a small triangle. If the price breaks out and all my indicators are putting the odds in favor of a long trade, then we will be looking for a buy point on the weekly chart in the next few weeks. The weekly trading signals are good for intermediate and long term traders. 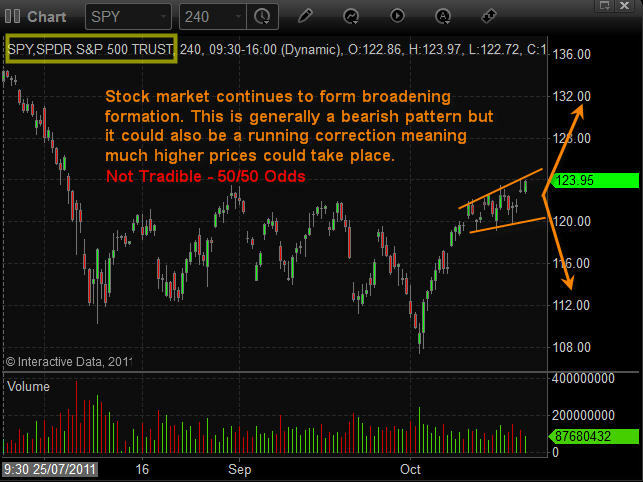 The broad markets continued to move lower last week as it remains in a long term bear market. For those looking to take advantage of gold, silver and oil movements I recommend sticking with the commodity funds as they can increase in value while the broad market is selling off. The daily chart of the hui gold bugs index shows this clearly as gold stocks in general are underperforming the price of gold right now. There is an opportunity for oil to make a move higher if things come together in the next couple of weeks but until then we will be patient and let the trade come to us. Gold prices shot up on Friday as investor’s move their money into a safer investment as the broad market continued it crash the day before breaking the October bottom. Once the price of gold climbed over the $760 mark which was a short term resistance level the price shot higher as new buyers jumped in and short covering took place pushing gold to climb $57 in one day which you can see in the chart below. 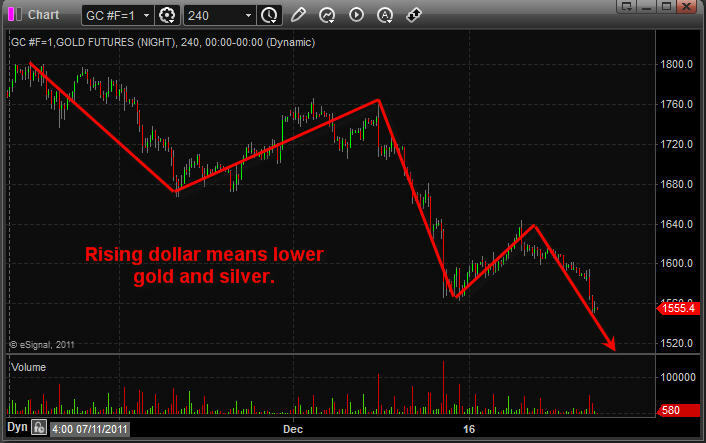 Now, looking at the daily chart of gold below, it appears that it has put in a double bottom with a nice rally higher. Also confirming this move may not be over yet is the MACD cross over and the strength of gold. Its best to waiting for a low risk setup before any money should be put to work. We are getting close to possible buy signals if things continue to hold up over the next week or so. Gold will find resistance between $800 – $825 and could take a breather for a few days which could provide a great setup if we are lucky. Gold stocks shine as they rally big on Friday out performing the price of gold and possibly putting in a higher low for the HUI which could be the start of an upward trend. 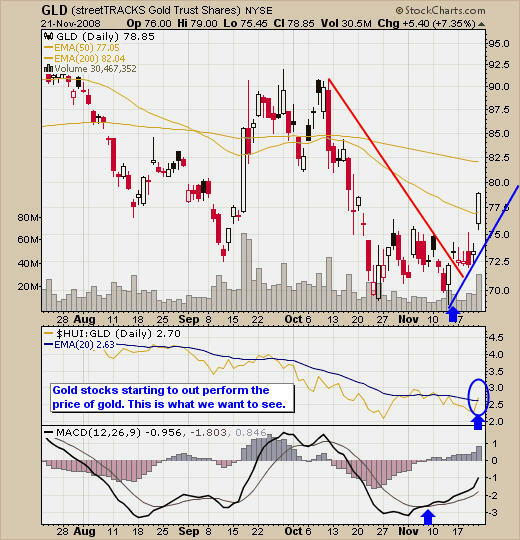 Keeping a close eye on the performance of gold stocks will help confirm a low risk setup for trading gold (GLD, DGP, and Spot Gold). 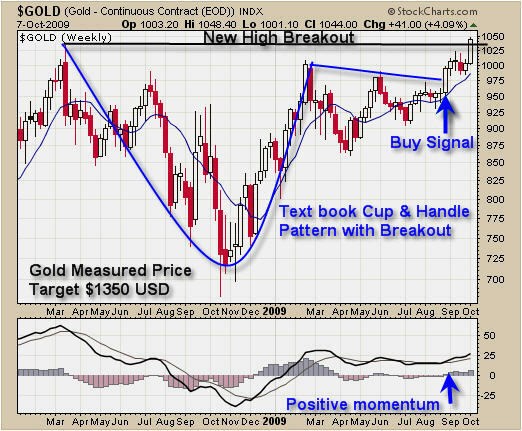 If gold stocks are performing well during a gold buy signal I generally put more money to work on that trade as opposed to gold stocks underperforming the price of gold. 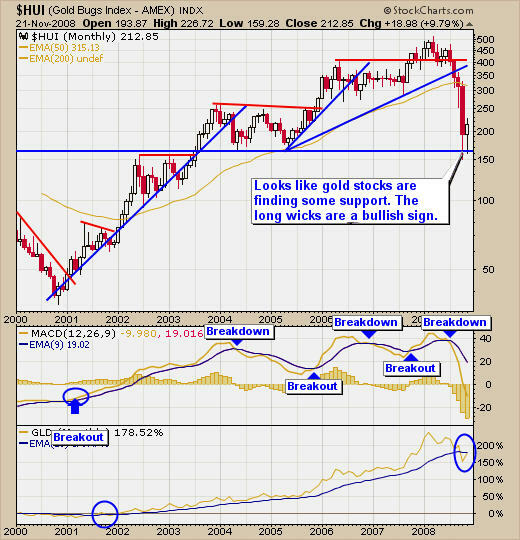 A longer term look at gold stocks performance which is shown in the chart below is the fact that they are bouncing off long term support which has been tested 5 times. 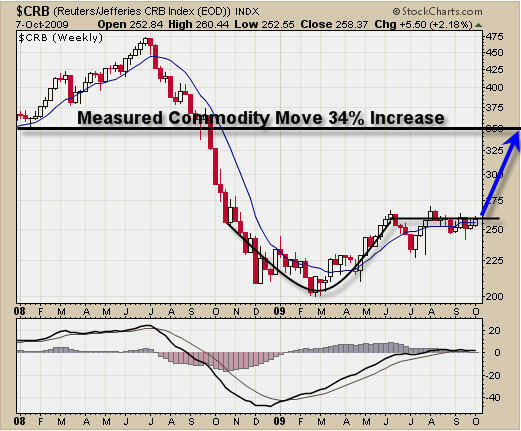 This is very bullish for gold and gold stocks as well. Oil Traders cannot believe the slide in oil since June this year. Last Thursday oil closed below $50 which is a long ways of its $150 high not to long ago. 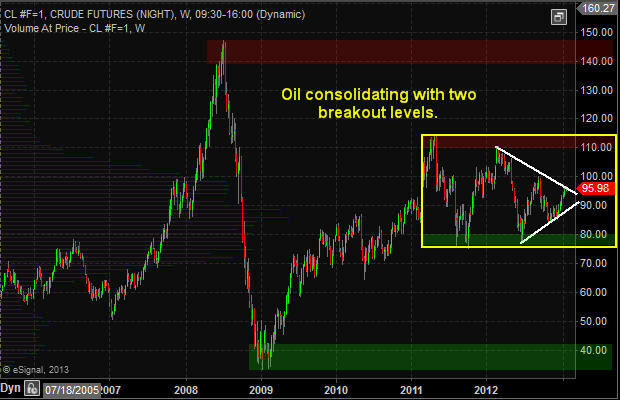 A couple interesting things show up on my oil chart which I thought are worth pointing out. Obviously the price of oil is severely oversold and due for a dead cat bounce if not a “V” shaped bottom. But although prices continue to slide the momentum is starting to shift to the up side. The MACD is trying to move higher which is a good thing and also the fact that oil is at the bottom of it channel. Also energy stocks are out performing the price of oil like crazy!!! 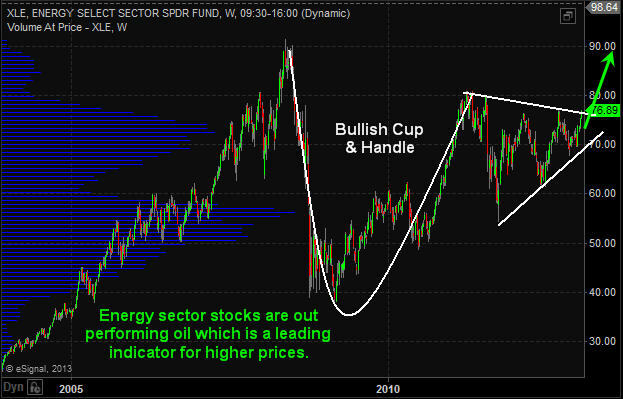 This is extremely bullish and a bounce in oil will send energy stock soaring. I will note that a lot of energy stocks pay a dividend and with their share prices being pushed down to these extreme levels, investors are starting to buy because the dividend rate is so high and most of these companies make solid earning year after year so at these prices the shares look attractive to many. I don’t try to predict market direction because it’s a fools game, I do think we have some exciting times just around the corner if the market does find support in the next week or so. I have been in cash since August waiting for a setup but volatility is ridiculously high and I don’t put my money to work if I’m risking more than 3% on a trade. Gold Stocks are starting to have money flow back into them and oil is starting to look like its downward move is almost exhausted. I continue waiting for a proper setup with low risk as I believe in taking the safe middle section of trends and not trying to pick tops or bottoms. I am a full time daytrader and swing trader specializing in trading GLD, GDX, XGD.TO, SLV and USO. I provide my trading charts, market insight and trading signals to members of my newsletter service.